With a stand golf bag, you can take better care of your clubs and worry less about your bag during those crucial moments when your focus should be specifically on your swing! The best stand golf bag should be sturdy enough to stand firmly when you are teeing up but lightweight enough that you can carry it when walking from one hole to another. Learn more about why you need a stand golf bag and check out quick overviews of 3 of our top picks! 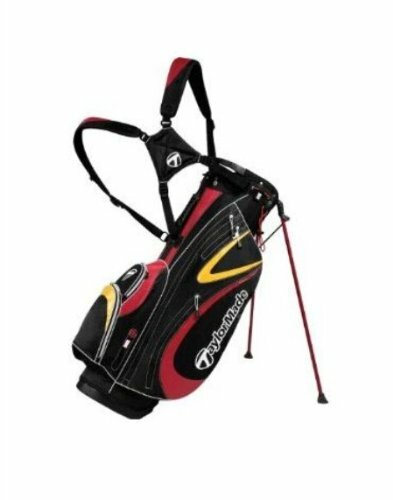 There are many different styles of golf bag that you can choose from and each one is designed to serve a specific purpose. 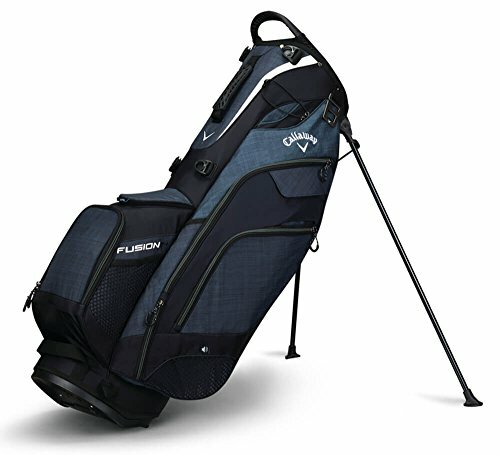 A golf stand bag is ideally designed for those who plan to walk the course (although many can easily be loaded on a golf cart with no trouble). Lightweight. Many golf bags, especially the rolling ones or the ones primarily intended for being loaded on golf carts get to be pretty heavy. But golf clubs are heavy enough. If you have to lug something on your back, you want it to be as lightweight as possible. Golf stand bags usually tend to be the lightest option. Stress free while teeing up. Not all carrying bags come with a stand. That means you either have to ask someone to hold your bag for you or just lay it on the ground. Over time, this can cause damage to your clubs. A stand bag allows you to keep the bag standing when you aren’t wearing it so you can easily access your clubs and other equipment while also giving your clubs the treatment they deserve. When you’re planning to walk the long distances that exist between each hole on a golf course, these are exactly the kind of benefits that should be the highest priority for you. The 3 stand golf bags you will find below were chosen because they are each a great balance of durable materials and lightweight construction. Each one also boasts a few additional features that really help them to stand out from the crowd. 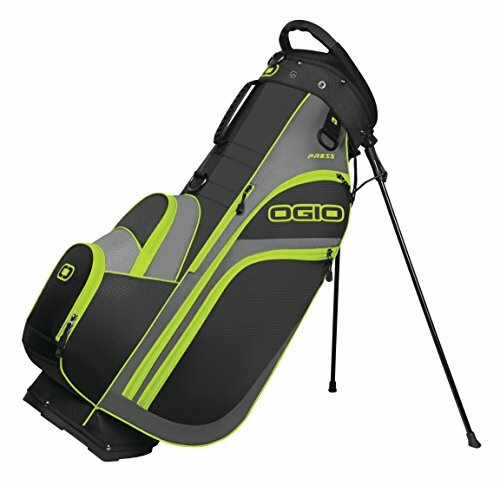 This is a really well designed lightweight stand golf bag which is convenient for carrying more than just your golf clubs! This is the most comprehensive golf bag on our list. With 14 pockets, you not only have lots of storage space but sufficiently divided storage space so you can keep your valuables protected in one pocket where they are safe from the golf balls in another. This helps you stay organized so that you don’t waste time digging through your equipment just to find a tee buried at the bottom of some huge pocket. Manufactured from ultra durable 1680D Poly, 420D Dobby Nylon, 900D Nylon, 600D Poly, 1000D Poly, and 300D Poly materials. For those who feel like 14 separate pockets is going a little overboard, this bag still provides good variety. And in the 6 pockets, you still have the 2 essentials: your valuables pocket and your beverage pocket. The valuables pocket is fleece-lined to provide added protection to delicate items. And the beverage pocket is insulated to keep beverages cold on hot days. And it’s even located within easy reach while walking so you don’t have to put your bag down just to take a drink! This golf bag stand from Taylor Made is one of the highest quality standing golf bags you will find. Taylor Made has designed one of the lightest weight golf bags around that also still manages to provide a surprising level of firmness and stability when standing. It’s not as elaborate with the club dividers as some of the others you’ll find but it’s got the essentials you need and it has incorporated those essentials into a super sturdy (but also super lightweight) frame that will effortlessly go from shoulders to standing! Choosing the right golf stand bag is about finding the right balance of quality and budget to suit your needs. For example, we don’t all need 14 separate pockets so we don’t all need to spend the extra money to have them. But if you are someone who will need all 14 pockets, a 6 pocket bag is going to feel woefully inadequate. So take a moment to think about your key priorities when it comes to golf bags. Then order your favorite and get out on the green!